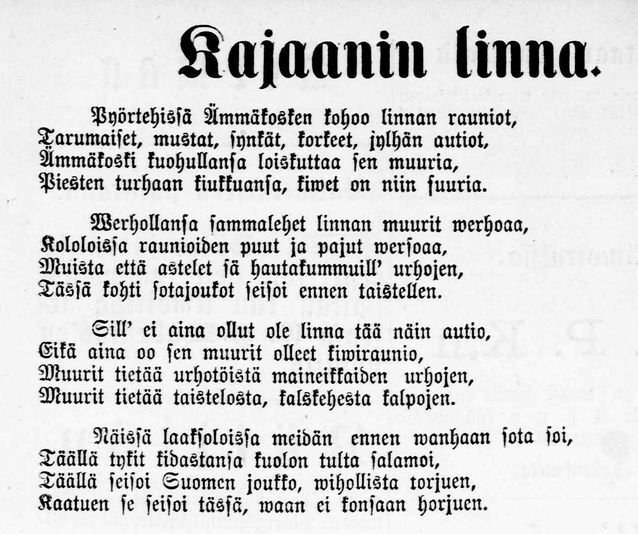 Leino’s first poetry appeared in the pages of a provincial newspaper, the Hämeen Sanomat, in 1890. The poet was a mere twelve years old. During his school lessons, apart from his own literary production, Leino busied himself with Finnish translations of the Swedish-language poet Johan Ludvig Runeberg’s works. Later his schoolmates told about his peerless stature and inspiration as a writer in their midst. Having passed his school examinations, Leino enrolled in the Imperial Alexander University in 1895, with it in mind to study Latin. His studies however never came to much, nor did he complete his degree. Leino had turned to writing. His early verse found inspiration in the national epic, Kalevala, together with other mythical Finnish poetry. His first collections, Maaliskuun lauluja (‘Songs of March’) and Tarina suuresta tammesta (’The tale of a mighty oak’) were published in 1896. Similar themes in what is perhaps his best known collection Helkavirsiä (1903). Leino is held to be the first and most important shaper of national romanticism in Finnish literature. During the course of his first marriage to Freya Schoultz from 1905 to 1908 he wrote more and more prose. There was, for example, the so-called year of the frost trilogy Tuomas Vitikka (1906), Jaana Rönty (1907) and Olli Suurpää (1908), in which he satirised figures who had capitulated before their Russian cousins. In the last year of the marriage he travelled to Rome and began preparations for an ambitious project – to translate Dante Alighieri’s Divina Commedia into Finnish. Jumalainen näytelmä, ‘The divine play’, came out in the years 1912-14. Leino’s oeuvre is voluminous. In thirty-five years he produced a total of eighty or more original works of poetry, plays and prose. He also wrote a great many essays, sketches, reviews and other pieces of journalism, not to mention countless translations. His work encompasses a wide emotional range, anything from profound love to misanthropy and biting criticism. Leino was awarded the state prize for literature on eight occasions and, at the age of forty, was granted a state pension in recognition of his writing. In his last years as he grew sick and tired, Leino returned to the national romantic themes of his youth. 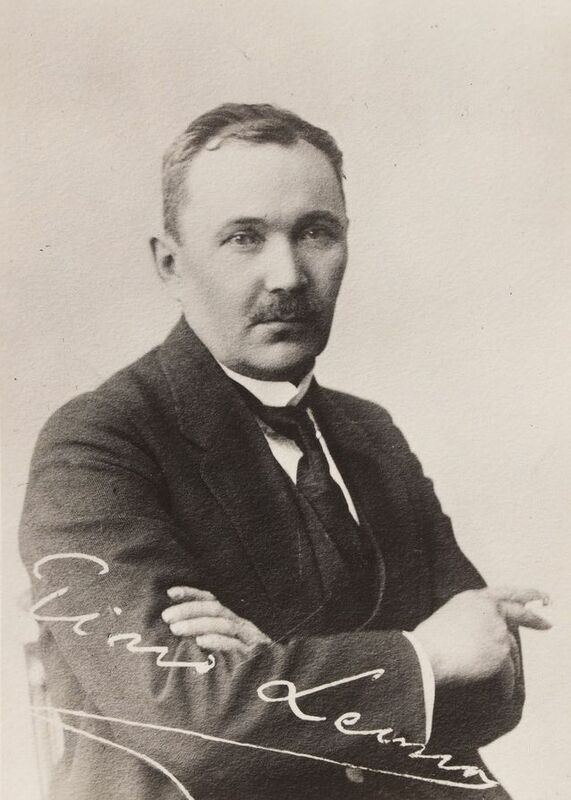 His last work was the first instalment of what was intended to be an autobiography in three parts: Elämäni kuvakirja (‘My life in pictures’) was published in 1925, the year before his death. Maria-Liisa Nevala, ‘Leino, Eino (1878­–1926). Writer’, National Biography of Finland online. Accessed March 12, 2015. ‘Eino Leino’ Historical Humanists online. Accessed March 12, 2015. Petri Liukunen and Ari Pesonen, Eino Leino (1878–1926) – originally Eino Armas Leopold Lönnbohm, Author’s Calendar online. Accessed March 12, 2015. Wikipedia, Eino Leino, Accessed March 12, 2015. Eino Leino, ’Kajaanin Linna’ (’The castle at Kajaani’), Hämeen Sanomat newspaper, September 26, 1890. National Library digital collection. Accessed March 12, 2015.